Is Cottage the new word for Country? I picked up the Cricut LITE Botanicals Cartridge at Wal-Mart this past week for only $20...figured I couldnt pass it up, even if I were only to use a few images. The designs are highly intricate, so you need to get your settings just right for a good cut. I loved this heart and thought it would work lovely for lots of challenges. 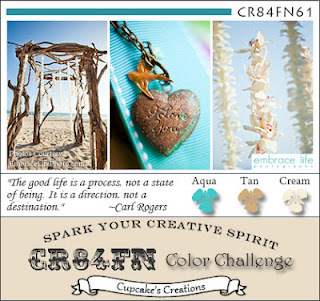 My colors were determined by the CR84FN61 color challenge of aqua (I chose Bo Bunny), tan and cream, very cottage/shabby/chic/country colors to me. Of course those colors lend themselves to other styles too! I wanted to offset the cut with some dry embossing with a wood grain Darice folder, I thought it would add interest to the die cut. With the advent of so many wonderful embellishments, I feel like you really need to work harder with the die-cuts to get them to pop and look current. I think it turned out alright! I decided to forgo a sentiment since I could not figure out where to place it, besides, it could always be put inside the card. 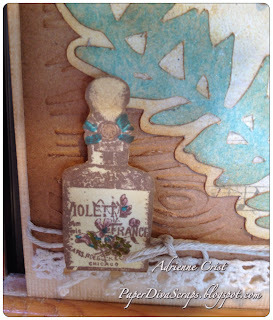 Instead I added the little stamped image of the perfume bottle. I had been wanting to use that one for a while now. Crochet lace and some hemp twine seemed like the natural compliment. I recently ordered some metal flowers and thought it would be a nice compliment to the heart, but the embellishment was on the thicker side due to a dip in the center...took out my trusty jewlers' hammer and pounded away to get it to flatten out a bit, that made it easier to glue down with the ever faithful glossy accents. Added a teenie tiny flower which I toned down a bit with distress. Of course the main die has been distressed with Tea Dye ink and some of the Distress Markers were used to add color to the perfume bottle. The die cut also got a spritz of Glimmer Mist in pearl, which has a lovely finish! 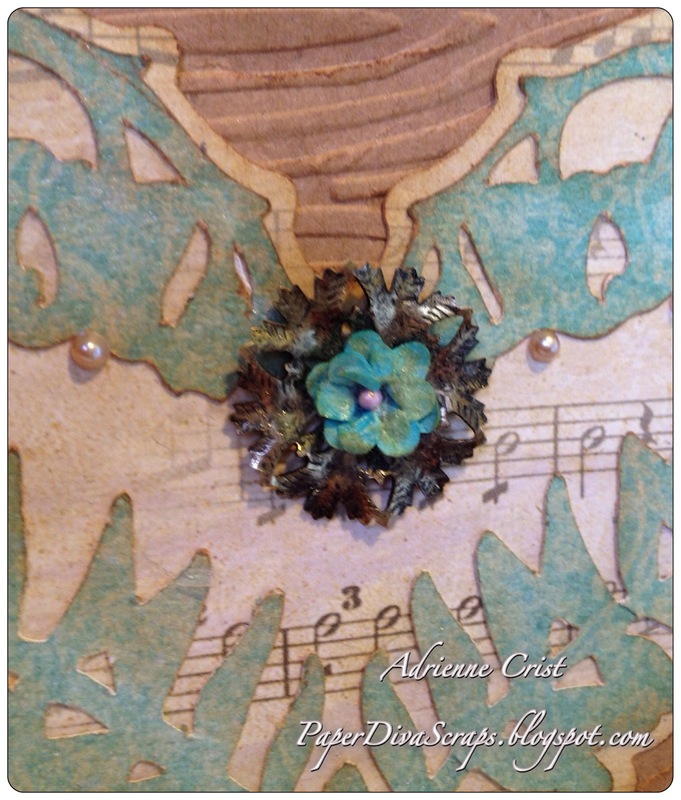 Craft Your Passions Challenge 125 - Emboss It! Wowza!! I love this card! You really made that die cut jump off the page with the colors and the music DP backing it. 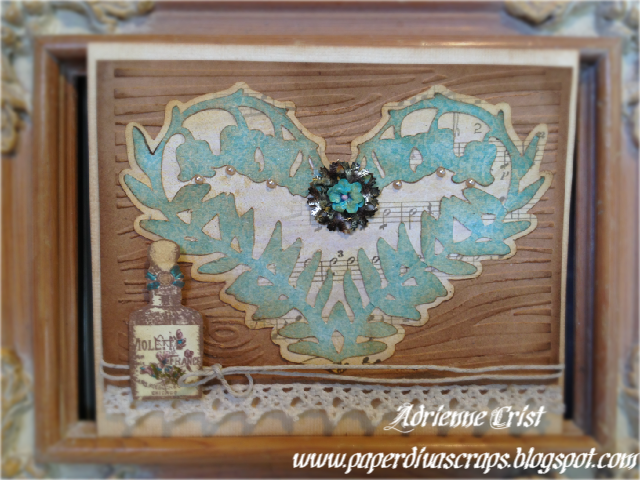 I love all the details including the embossed wood grain, the perfume bottle and the crochet lace. Thanks for the lovely comments and for noticing all the details! Your feedback makes me smile ;). So creative - the cut out is very elegant. Thanks so very much for joining us this time at the Gingerloft Challenge. Gorgeous! Fabulous layout. 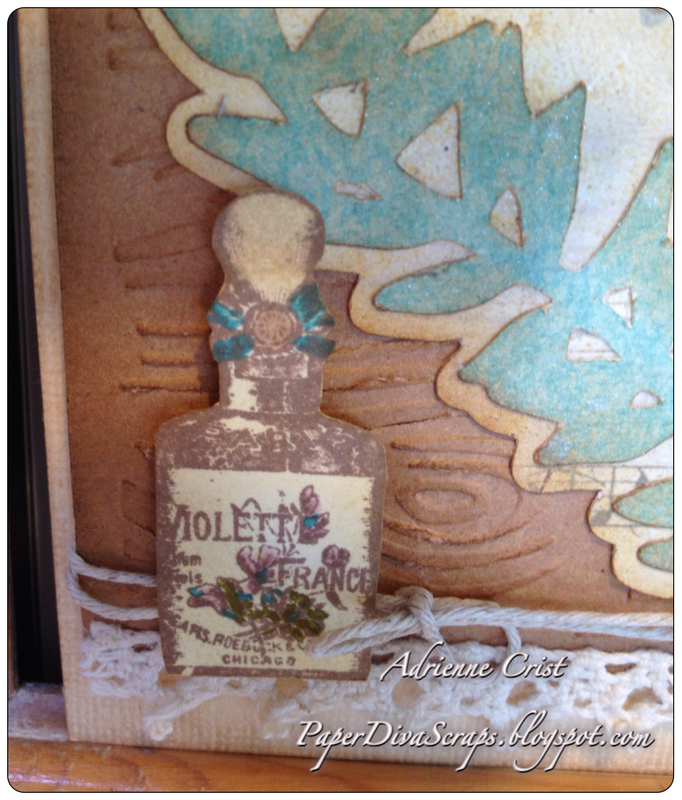 Love your flower embellishment and great job on creating the cute bottle. Thanks for joining us at Gingerloft. Hope you join us again soon.